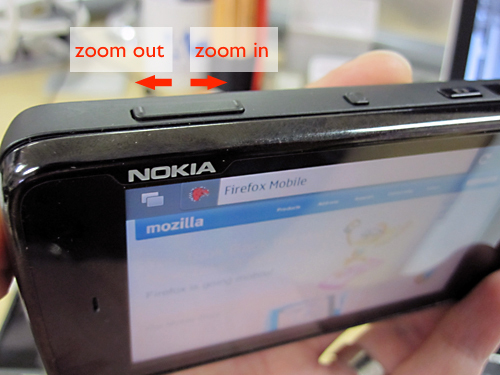 One of the most requested features after we released Firefox on Maemo (Fennec) 1.0 was for a way to "free-form" zoom. Fennec already supported what I call a "structured zoom" - that is, double-tapping that zooms to fit the part of page structure (a column of text, an image) that you're tapping on. That method doesn't help you in every circumstance, though, and that's where a free-form or arbitrary zoom mechanism is useful. 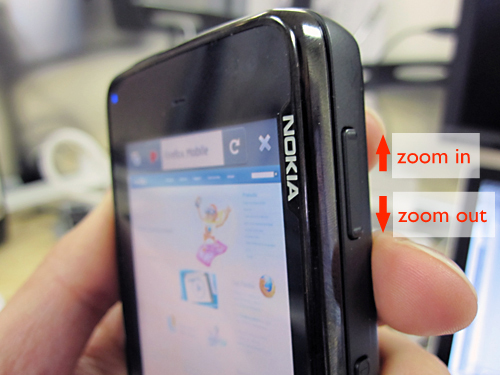 The zoom rate isn't constant as you zoom in and out. If it were, the change in zoom level would seem tiny when you're zoomed all the way out, but huge when you're very zoomed in. The rocker button adjusts itself for whether you're holding the phone in landscape or portrait to maintain natural increase/decrease mappings with up/down and left/right (for LTR languages, anyway). See the photos above for an illustration. Ideally, you won't notice either of these things in day-to-day use; it should just feel like it works the way you'd expect.